When my family and I walked into a pet adoption event a few years ago, a dachshund/miniature pinscher mix was the last thing I expected to take home. I had grown up scared of Doberman pinschers, so I figured the mini versions wouldn’t be much better. My son was only 5 years old, and I wanted a pet that would be great with small children, especially if we decided to add to our brood. It turns out I was entirely wrong about pinschers. Neither variety is particularly dangerous; in fact they’re loyal, obedient, and highly trainable — perfect dogs for families with small children. Good family dogs are friendly, patient, and generally tolerant of little kids who may occasionally pull a tail or step on a paw. Here, a few of the breeds to consider if you have small children running around. Friendly and outgoing, labs play well with others, which may explain why they are the most popular breed of dogs, according to the American Kennel Club. I grew up with a black lab, and I can tell you from experience they love to play and they have a hearty appetite, so you may need to look for dog food specifically designed for active dogs, such as Beneful Chopped Blends. They are, however, high-energy dogs who love to play fetch, jump, and run, so they tend to do well in families with kids of varying ages, so there’s always someone willing to play. Similar to the labrador in temperament but smaller in size, golden retrievers are smart and devoted, which is why they’re sought-after by families with young kids. They’re also kind and obedient, which explains why they’re often used as guide dogs. Active and energetic, they need regular exercise, but they’re extremely flexible and adapt easily to just about any situation. Far from lap dogs, this breed is best in a home where there is plenty of room for both kids and pets to roam comfortably. Snoopy is probably the world’s most famous beagle, and what’s Snoopy if not lovable, happy, and generally easygoing? OK, maybe the cartoon version is not exactly laid-back, but the real thing certainly is, which is why they’re among the most popular breeds for families. 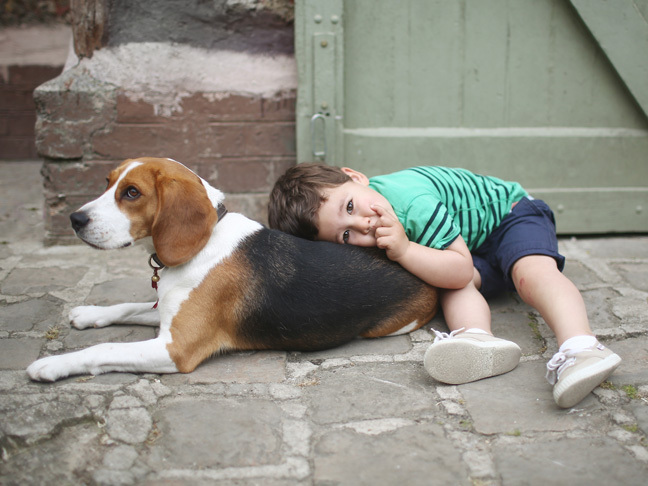 Beagles are hounds, meaning they love to explore and crave exercise, so they make a great match with kids who love to spend time outdoors. This breed’s friendly and generally happy demeanor means it takes a lot to get these dogs upset. Don’t be fooled by their mean facial expressions. Bulldogs are calm, courageous, and friendly, according to the American Kennel Club. They also don’t need a ton of exercise. Just a couple of regular walks and the occasional romp with your kids is more than enough to keep them healthy and engaged. If your family is always on the go juggling multiple work schedules, extra-curricular activities, and more, a low-maintenance bulldog may be a good choice. Sweet, patient and known as great companions, Newfoundlands have earned the nickname “nature’s babysitter.” This breed loves children and can be very protective over them, which can provide you peace of mind when you’re not around. They are large dogs that require a fair amount of exercise, but don’t let that scare you off. Their sweet disposition more than makes up for it.